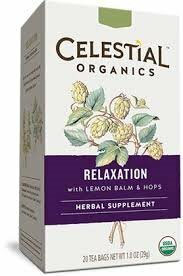 Celestial Organics Relaxation with Lemon Balm & Hops. Sip your way to tranquility with this simple blend of pharmacopoeial grade organic herbs. Lemon Balm for calming and Hops for calming. Simple Blends of organic ingredients that provide specific benefits for your body and support everday well being. Because wellness doesn't have to be complicated. If you have any questions about this product by Celestial Organics, contact us by completing and submitting the form below. If you are looking for a specif part number, please include it with your message.